A year ago, I never would have considered there was an ethical decision to be made when selecting swaddling for me tootsies. But as a vegan, even a purchase as simple as socks needs to be done consciously. For those veg-curious popping in (hello there, you’re lookin’ well) the vegan philosophy extends beyond what we eat and drink. Once I decided to become a vegan I had to re-evaluate all the products that I use in my life and whether or not they came to me as a result of the enslavement of animals. Now I know that word is a little extreme —enslavement — but don’t bolt. If you think about it, it’s spot on. It’s an accurate way to define what is happening in animal-related industries. Animals are kept under our will and made to work to produce whatever product us humans are after. Now, I understand that it is difficult for some people to see it that way. Animals are viewed as cogs in the machinery — and that machinery’s purpose it to make money. And that is the way it has been for a very, very long time. So expecting people to change their perceptions overnight is unrealistic. But I see it a little differently. I see animals as persons. And so, when faced with a decision to purchase from an industry that makes life very uncomfortable for these persons — I choose not to. So I no longer buy wool. Now I never want this space to have a soapbox. I know that will send the veg-curious among you packing as quick as you can scream, “she’s a preaching vegan, run for your life!” But I will explain my decisions as I’ve found a lack of understanding can change people’s perceptions of my lifestyle unnecessarily for the worst. And if you want to find out a little more about some of the problems with the wool industry then you can cautiously click here and here. No one’s watching. 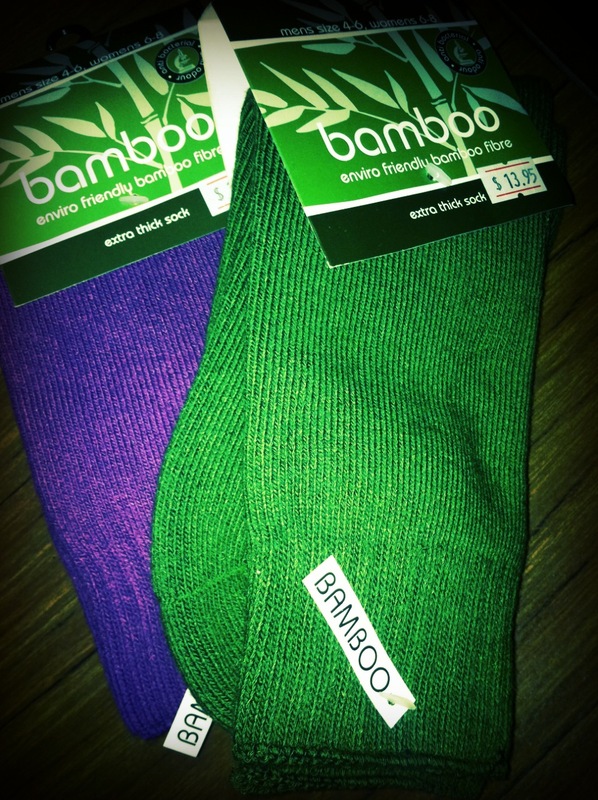 These bamboo socks are fully sustainable, they are produced without the use of chemicals and they have anti-bacterial properties. Now, of course, I don’t suffer from smelly feet so I can’t attest to their anti-odour benefits but I wore them after a long, hard day upright and they were super warm and comfy. They are more expensive at 14 bucks a pair but they are animal and environmentally friendly so they get two thumbs, erm, big toes up from me! What are your favourite wool alternatives?